On Sale Now! Save 5% on the Skywalker Signature Series Y Type Chimney Mount with 18ft Steel Straps by Skywalker at Home Entertainment Centers Online. MPN: unknown. Hurry! Limited time offer. Offer valid only while supplies last. Y-Type Chimney Mount Install the Skywalker Signature Series Y Type Chimney Mount with ease! Chimney mounts are the most common mount on the market. Install the Skywalker Signature Series Y Type Chimney Mount with ease! Chimney mounts are the most common mount on the market. When properly installed they can be a simple solution for homeowners of all kinds. Mount on a sturdy chimney and minimize stress by attaching the straps specifically according to the installation manual. Place the top stray high up on the chimney and make sure to place the bottom strap as far down as possible. Mark the proper placing, fasten the mast to the mounting bracket, and you're done. 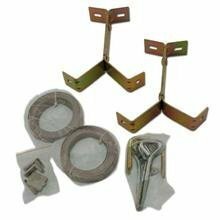 Designed for mounting TV antennas/dishes on existing chimneys - most commonly-used mount type on the market!